This week's pull-list only featured two books that were both must-reads. In this slow week I didn't feel it was appropriate to name one as the pick of the week and felt a simple review of two titles that you absolutely should be reading would be a better approach. In no particular order I present this week's books that are complete polar opposites of one another. Curse Words #2 - The first issue of this series hit me like a van from the 80's with a radical wizard airbrushed on the side. If that isn't enough to get you on board, the email in which to send letters has a .horse domain. That is correct. Dot freakin' horse. In the first issue Wizord, a fierce wizard sent to earth from the Hole World, realizes that he cannot destroy the world in which his powers make him virtually a god. This upsets Sizzajee, the leader of the Hole World who sent Wizord to destroy all humans. We last left off wondering what became of the baseball stadium and the fans within after witnessing Wizord murder Cornwall (another wizard sent to kill Wizord). In this issue we learn the fate of the stadium and its residents, and learn more about Wizord, Sizzajee, and this acid trip of a world that Charles Soule and Ryan Brone have created. The first two issues have been a complete sensory overload and this is rapidly becoming my favorite book. I might even have to send an email to a .horse domain for only the third time in my life. Valiant High #1 - If you haven't been reading some of the stellar books that Valiant has been publishing then you are missing out. I am a big fan of Bloodshot and Faith has been a massive hit. When I heard that there was a mini-series consisting of the Valiant heroes as high school students, I was intrigued. 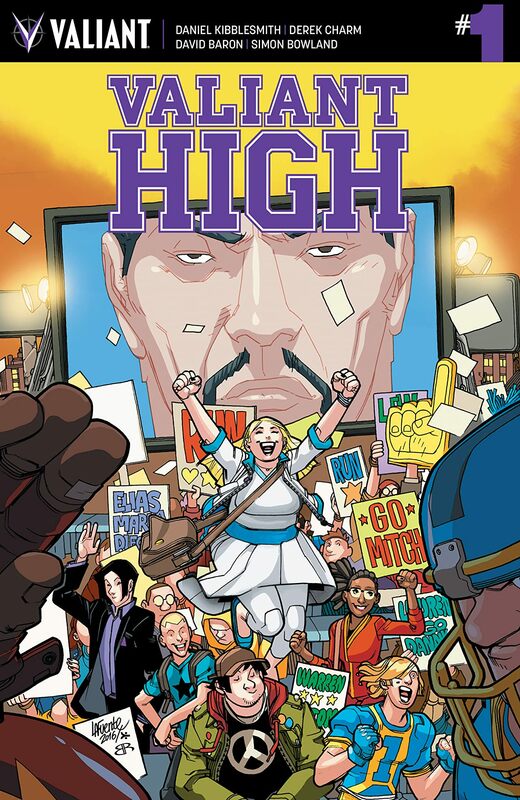 Under the leadership of Principal Harada and gym coach Bloodshot (my favorite), Livewire, Faith, and other high school heroes will have to navigate the issues that all teenagers deal with. In this mash-up of Archie, She's All That and Sky High, writer Daniel Kibblesmith infuses this series with smart humor, high school antics, and a lot of Bloodshot yelling. This book serves as a fun way to learn about the Valiant Universe and promises to be a lot of fun.